Accenture details push for ‘Industry X.0’ in order to help as many companies benefit from the IoT as possible. The Internet of Things (IoT) has already had a transformative effect on many areas of everyday life, and consumers and businesses alike see the benefit of smart, connected devices on their work and home lives. However the technology is also set to bring major changes to other areas too, particularly in heavy industries such as manufacturing, utilities and power. The so-called IIoT (Industrial IoT) has enjoyed a surge in the past few years, helped by the backing of Industry 4.0 initiatives across Europe, looking to change factories and plants across the continent. As one of the world’s best-connected firms, Accenture has long been at the forefront of pushing the latest technologies and ideas, and the company is now looking to further its own view of future industry that it calls Industry X.0. Speaking at an event in the company’s newly-opened The Dock R&D facility in Dublin recently, Aidan Quilligan, managing director and Industry X.0 lead at Accenture, told ITProPortal that following the rise in smart workplace systems over the past few years, Accenture is hoping to encourage more organisations to modernise their factories as well. "When you look into the core of most companies today, they don't actually yet behave fundamentally different to the way they did a couple of years ago," Quilligan said. "We believe a lot of technology is now going to make its way into industry - and not just one industry, but all of the industries." 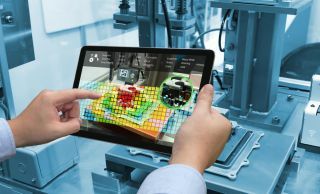 "There is now universal belief that there are benefits in this Industrial Internet of Things, but the big question is, what is it, and where is it, and how do I get it? A few companies have proved under the microscope that it is there, but trying to get it out is the real challenge." Quilligan noted that there is still no real standardisation around the industrial IoT, but that Accenture was working with some of the world’s top technology firms to try and build a framework that works for all sides. “What has to come into place then is a more complex view of that architecture, but done over time, so that you can do something today...knowing that it's going to be out of date in three or six months time - and how they deal with that." "It's not only about Industry 4.0, it's not only about manufacturing, it's certainly not only about Germany...there's going to be a succession of movements towards what this is all about." Accenture now sees a role for itself as bringing together its customers with the latest technologies, and is heavily involved in developing its own wide range of services and solutions. "What we do well is integrate emerging technologies to deliver business results,” Quilligan says, “and that is what is needed in spades to make this work. Lots of companies are getting proof-of-concept working...the real trick is getting it out into your company, into multiple factories, and start seeing the benefits and unlocking value - that is what's hard." Whilst at The Dock, we were shown several examples of how IoT technology can benefit a wide range of industries. This included an online platform to manage a mine, showing detailed information on all workers, tools and resources in real time, and a smart parcel tracking platform that could identify any issues with handling or temperature to improve the overall deliver service. "We are facing unprecedented levels of change in companies...we're going through these challenges too, we have to face these waves of technology that are coming out,” Quilligan said. “That is a tough challenge for companies to deal with managerially, and that's why companies are really struggling to manage all these things simultaneously."